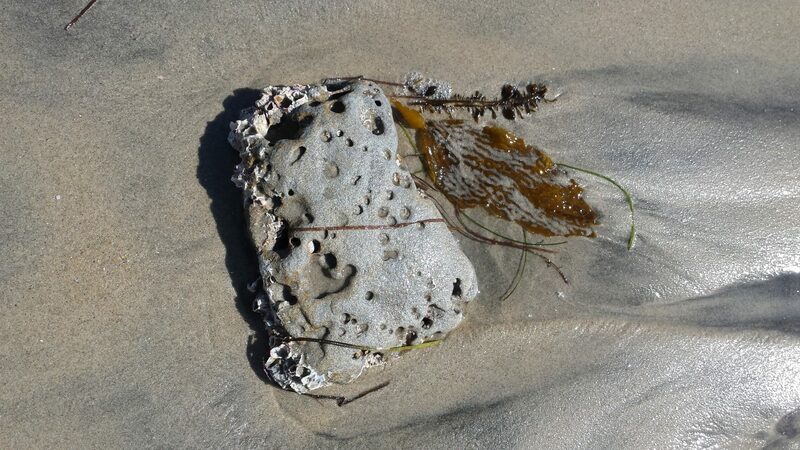 When I was at the tide pools some months ago, one of the volunteer guides told me that the holes in rocks like these are bored by the secretions of the small sea animals that make their homes on and in its surfaces. Lots happening on this rock, encrusted with shell-like material, draped with two kinds of seaweed/sea grass, and marked with the crater-like remnants of creatures unknown. Creatures Unknown. Doesn’t that sound like the title of a horror movie or, perhaps, a nature documentary? As I write, I look up and see a book on my desk with the title of Life Between the Tides. Many of my photos are of “between the tides” evidence. And maybe we ourselves are just between the tides?